Well, darn! When you see something that cheap, and get your hopes up, it’s sad to have those hopes dashed, isn’t it? And it was even worse to learn that HHGregg had plenty of fully-functional Android tablets like this Samsung one for $179.99 in stock, which the clerk made sure to show me. I felt baited. And switched. So I walked out without buying anything at h.h.Gregg. As it happens, you can use Amazon’s Android app-getting application on the Curtis LT7033 with a little finagling, and most reports say the hardware is good; the only problem is with the software, and since you’re going to replace that immediately it doesn’t matter. But this is kind of offensive to me, the same way it would be to buy a brand-new $15,000 car and be forced to buy a $5000 aftermarket engine for it right away because the factory one is a total dog. So… hmmm… what other super-cheap tablets are out there? I wrote about this a few weeks ago, with a strong look at tablets available from an international retailer called LightInThe Box.com. I also checked Amazon, but was not impressed with the tablets they offered. The store I forgot to check was Wal-Mart. They may be the dregs of American retail, but since all tablet computers are made in China anyway, Wal-Mart is no worse a place to buy one than anywhere else. At WalMart.com I found this $69 tablet, accompanied by copy that explicitly says it has Google Play pre-installed. Since not all Android apps work with all Android hardware, there’s still a little risk. But Wal-Mart’s shipping is free, and if I don’t like it a return won’t be a lot of trouble because their nearest store is less than five miles away. 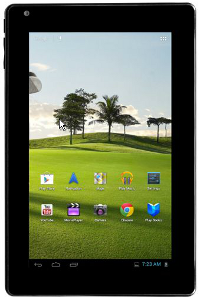 So I have ordered a “Nextbook 7 Tablet with 8GB Memory” from Wal-Mart. I don’t expect a whole lot from it for $69. I just want to read books and watch 480p videos on it, maybe read and respond to a little email while lounging on my patio. That sort of thing. My cheap tablet will be here in a week or so. When it gets here, I’ll let you know if it’s worth what I paid for it. Been there, done that! Nextbook is NOT your best bet, just my humble opinion. I bought one when they first came out (paid far more than $69) only to find that it had none of the features most tablets have. Apps only available through *their* app store, can't watch videos or movies, can't stream, can't read e-books unless purchased from *their* library. It alternately locked up or shut itself down with no obvious cause and overheated after being used for only 20 minutes. Purchased from HSN, who wouldn't take it back - said I had to go to the manufacturer (who wouldn't help because I hadn't bought it directly from their website), and HSN has removed it and all other Nextbook products from their site, as well as the hundreds of horrible reviews they received. Well, we'll see if those problems have been rectified. Note that I bought from Walmart specifically because I *can* return it at a store not far from me if it doesn't work out. Say, how did the experiment with the low-end tablet work out? Has Nextbook improved their product any?